This report is the product of Project MainStream, an initiative that leverages the convening power of the World Economic Forum, the circular economy innovation capabilities of the Ellen MacArthur Foundation, and the analytical capabilities of McKinsey & Company. These three institutions have launched the MainStream initiative and this report is an encouragement to continue to foster cross-industry collaboration as a major avenue to accelerate the transition to the much needed circular economy. A little more than 30 years ago, plastics overtook metals as mankind’s most widely used basic material and the gap between them has been increasing at a phenomenal rate ever since. Even today, more and more applications are switching over to plastics from other materials and the trend is proving to be quite relentless. There is good reason for this. Because of their combination of unrivaled functional properties, high strength-to-weight ratios, permanence and low costs, plastics have become the ubiquitous workhorse material of the modern economy. Their use has increased by over twenty-fold in the past half-century and is expected to double again in the next 20 years. It is impossible to imagine the replacement of plastics in virtually any application. Today, nearly everyone, everywhere, every day comes into contact with plastics all the time—especially plastic packaging, which is the focus of this report. Plastics and plastic packaging are an integral and vital part of the global economy. Plastics production has surged over the past 50 years, from 15 million tons in 1964 to 311 million tons in 2014 (the present annual global production is estimated to be some 370 million tons). It is expected to double again by 2035 and almost quadruple by 2050, as plastics come to grow in existing applications and find many new ones. It is expected to maintain a CAGR of 4% or more. Plastics are increasingly used across the economy, serving as a key enabler for sectors as diverse as packaging, construction, transportation, healthcare, appliances and electronics. (Plastics now make up roughly 15% of a car by weight and about 50% of the Boeing Dreamliner.) Plastics have brought massive economic benefits to these sectors, thanks to their combination of low cost, versatility, durability and high strength-to-weight ratio. There is absolutely no doubt that the exponential growth of plastics usage will continue. According to this report, plastic packaging is and will remain the largest application; currently, packaging represents 26% of the total volume of plastics used. 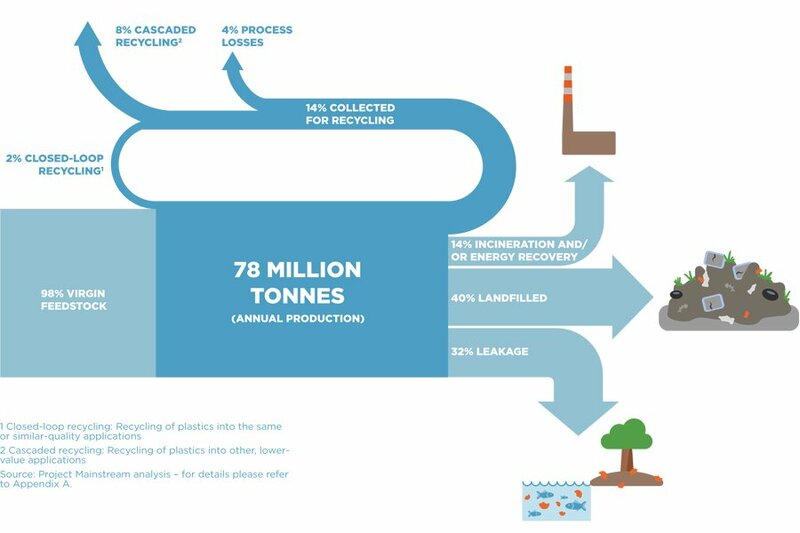 (I think this figure is very understated – many authoritative and detailed studies have established that as much as 38% of plastics production is used as plastic packaging.) Plastic packaging not only delivers direct economic benefits, but can also contribute to increased levels of resource productivity—for instance, plastic packaging (particularly when combined with food processing techniques) can substantially reduce food waste by extending shelf life with their barrier properties and can reduce fuel consumption considerably for transportation by bringing down package weight and increasing cube utilization. They also have a significantly lower carbon footprint than those of non-plastic packaging systems. The report states that between 2000 and 2015, the share of plastic packaging as a share of global packaging volumes has increased from 17% to 25% driven by a CAGR in the global plastic packaging market of 5% annually. In 2013, the industry put 78 million tons of plastic packaging on the market, with a total value of US$ 260 billion. (Here,again, I think the values are understated – the share of plastics in the total packaging materials usage pie is more like 35% or even more.) Plastic packaging volumes are expected to continue their strong growth, doubling within 15 years and more than quadrupling by 2050, to 318 million tons annually—more than the entire plastics industry in 2014. Why, then, are we discussing changes in the usage of plastics? This is because, while the benefits of using plastics are absolutely unquestionable and while their credentials as basic materials far outweigh those of other materials, they do bring with them some drawbacks in so far as the transition to circular economies is concerned. Today, 95% of plastic packaging material value or US$ 80–120 billion annually is lost to the economy after a short first use cycle. Although more than 40 years have elapsed since the launch of the well-known recycling symbol, only 14% of plastic packaging is actually collected for recycling. 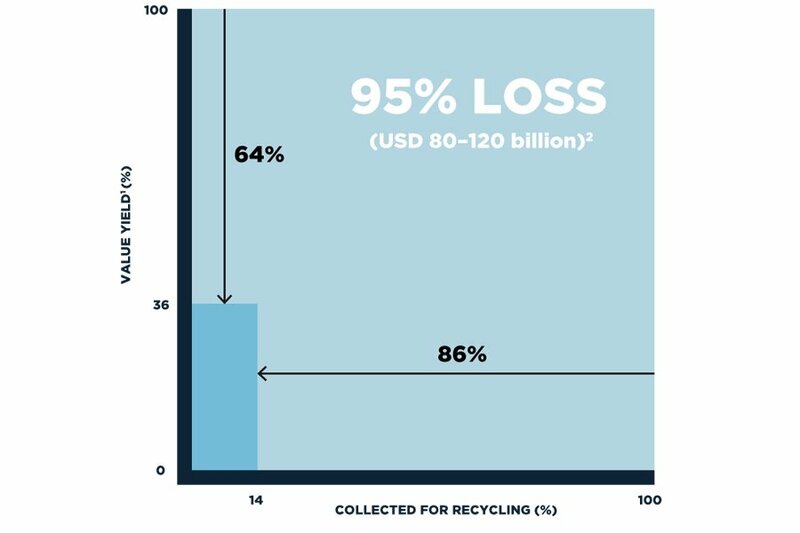 When additional value losses in sorting and reprocessing are factored in, only 5% of material value is retained for a subsequent use (see Figure 1). Plastics that do get recycled are mostly ‘downcycled’ (recycled into lower-value applications) and are usually not again recyclable after further use. The travesty here is that the crying need for optimization of natural resources and source reduction has seen the proliferation of mixed polymer systems and multi-layered structures like high-barrier flexible laminates (including metalllized substrates and foil laminates) as ideal solutions; these are almost impossible to recycle. Unfortunately, a major attraction of such solutions is that they are also more cost-effective than easily recyclable systems. The overall recycling rate for plastics in general is even lower than that for plastic packaging; both are far below the global recycling rates for paper (58%) and iron and steel (70%–90%). PET used in beverage bottles has a higher recycling rate than any other type of plastic, but even this success story is only a modest one: globally, close to half of PET is not collected for recycling, and only 7% is actually recycled bottle-to-bottle. In addition, hi-tech plastic packaging is almost exclusively single-use, especially in business-to-consumer applications like consumer packaged goods (CPG). A comprehensive overview of global flows of plastic packaging materials is given in Figure 2. In addition to the 14% of plastic packaging collected for recycling, another 14% is sent to an incineration and/or energy recovery process, mostly through incineration in mixed solid waste incinerators, but also through the combustion of refuse-derived fuel in industrial processes such as cement kilns, and (at a limited scale) pyrolysis or gasification. While recovering energy is a good thing in itself, the process still loses the embedded effort and labor that goes into creating the material. Another significant problem is that indiscriminate and uncontrolled incineration of waste is fraught with hazards like contamination of the environment and toxic effluents, as is often the case in developing countries. Even if the right anti-pollution statutory controls are in place, the disposal of the by-product pollutants is necessary. An overwhelming 72% of plastic packaging is not recovered at all: 40% is land-filled. I have already discussed earlier the problems associated with land-fills. For energy recovery in mixed solid waste incinerators, in particular, there are also concerns that over-deployment of such incineration infrastructure can create a ‘lock-in’ effect that, because of the large capital investments but relatively low operating costs involved in building up and running such infrastructure, can effectively push higher-value mechanisms such as recycling out of the market. As much as 32% of plastic waste collected leaks out of the collection system—that is, either it is not collected at all, or it is collected but then illegally dumped or mismanaged. The unfortunate part is that this leakage is diverted into harmful avenues like clogging of urban infrastructure and, more dangerously, into pollution of marine systems like oceans. We will discuss more drawbacks and their deleterious effects in our next installment.